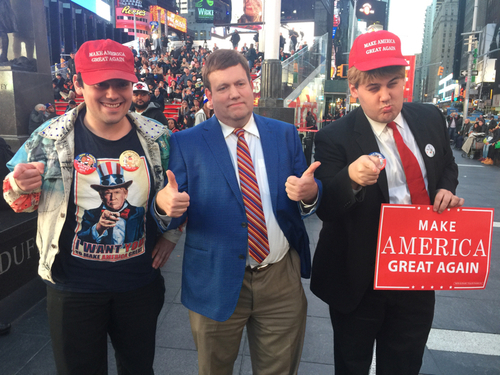 Here in Times Square we ran into famed pollster Frank Luntz. He told us that he thinks Hillary Clinton will win tonight by a narrow margin. They key states he says to watch are Florida, North Carolina, New Hampshire, Nevada and Michigan. "Americans are really angry and fed up and don't like either of the two candidates." 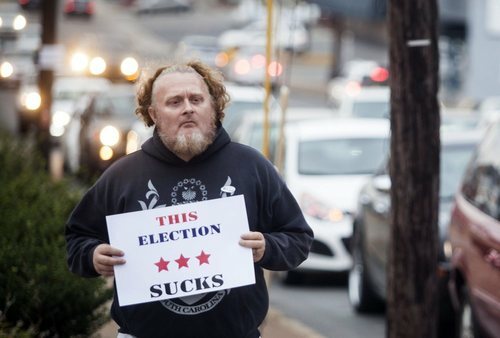 He hopes a concession speech from the loser comes early and from the heart and that the winner will reach across the aisle and political lines to begin the healing process. He says it will take years to heal the divisions from this election and that the level of anger in America is near what it was in the early 70s. The cameraman who is normally assigned to the White House travel pool is here. Maybe it's pizza in front of a bank of TVs for the Obamas tonight. Maybe there will be a vat of aspirin to go with it. The rest of the country may not know what tomorrow brings, but Barack Obama does. The plan is he sends a written statement of congratulations to the president-elect tonight, if one is confirmed. Tomorrow he may address the nation about the result. Or not. Then he'll meet with the new keeper of the POTUS title. The transition starts fast. And this might surprise, but the Clinton and Trump transition teams have both been meeting with White House officials. At the same time. In the same room. It has all apparently been cordial. There will then be 10 more weeks when Obama is in charge. He can probably forget a Supreme Court nomination confirmation or something similarly huge, but he'll be busy enough. And, in case it doesn't feel real enough already, if he listens carefully he can probably hear the construction for the inauguration parade pretty much outside his rather impressive windows. Signs stacked high. Trump supporters getting ready for their big night at campaign HQ in NYC. 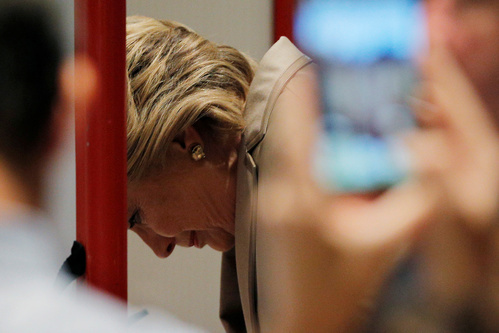 The race for the U.S. presidency is shaping up to be bitter and unpredictable. 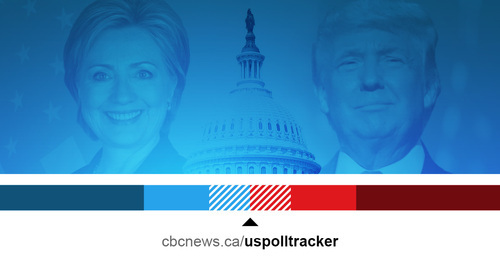 CBC poll analyst Éric Grenier tracks the polls and the candidates' chances. 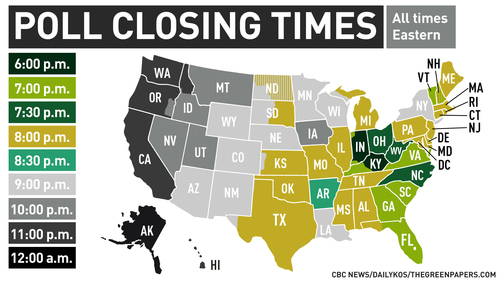 The polls are starting to close across the United States in the tumultuous American election. real idea of who might be the next president. Whoever wins Florida and New Hampshire is expected to be a good bet. Democrat Hillary Clinton has a clearer path to victory but Republican Donald Trump is offering optimism. "I do think a lot of the polls are purposefully wrong. I think I can almost tell you by the people that do it. "The media is very dishonest, extremely dishonest. And I think a lot of the polls are phoney. I don’t even think they interview people. 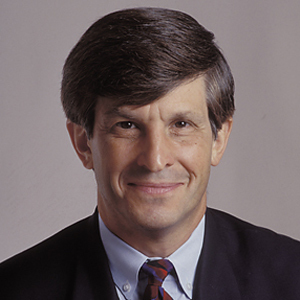 Meet Allan Lichtman, a political forecaster who has correctly predicted the winner of the presidential election since 1984. I spoke with Lichtman, who says that for the first time in more than three decades of doing this, he’s hedging his own prediction. The big reason is that Trump’s candidacy is just so dang unusual. Based on Lichtman’s 13 "keys," if six or more factors are determined to be false, or go against the party in power, that party's candidate loses. 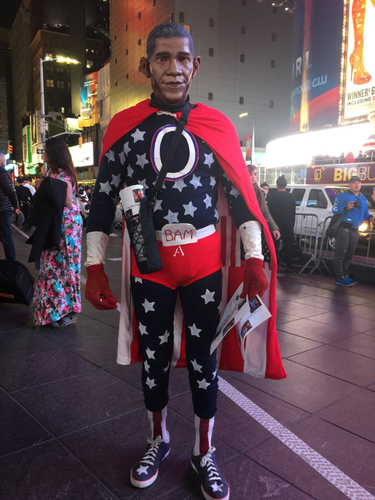 The Obamanator has made his way to Times Square. Two to three people have been wounded but gunfire near a polling station in Azusa, Calif., east of Los Angeles, but there's no indication yet the shooting is election related, police say. A man armed with a rifle opened fire on Tuesday near a polling station in the Southern California town of Azusa, wounding two to three people and prompting authorities to lock down the polling place and surrounding park, police said. 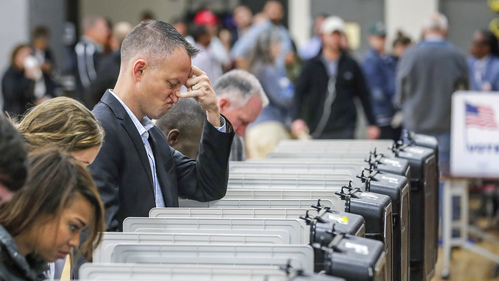 A spokesman for the sheriff, Deputy Vincent Plair, said there was no immediate indication that the incident was related to election day or the polling station. In some of the too-close-to call states, the get-out-the-vote ground game could be the deciding factor. Experts say the ability of a campaign to get its supporters out to the polling stations can be worth one to two points in favour of their candidate. Trump is at a disadvantage. Clinton's ground game machine dominates, has twice as many field offices than Trump across the country and is stronger in every battleground state. Trump, early in his campaign, made a conscious choice not to invest in these ground-game resources, said Republican strategist Ron Bonjean. 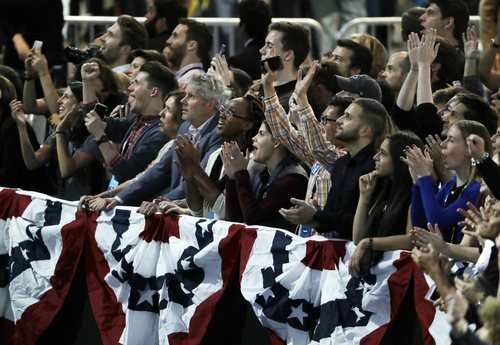 Instead, Trump hoped that communicating to voters through numerous rallies and press conferences would draw them to the polls. 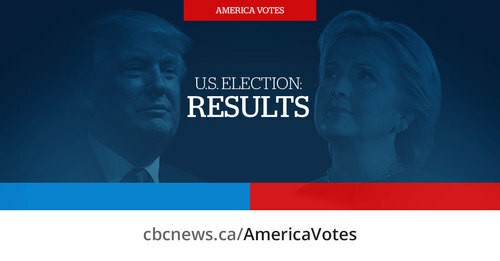 The first results should start to come in shortly after 7 p.m. ET. While we’re waiting for tonight’s results, why not invest ten minutes (yes, agreed, these days that's a lifetime) and watch the doc we put together a week or so ago on one of the more unsettling aspects of America that's been brought into focus during this campaign -- the hard lines now drawn between its divided population. Regardless of what’s happening on the ground and at the polls, on Twitter Trump fans love using the #MAGA and #MakeAmericaGreatAgain hashtags. 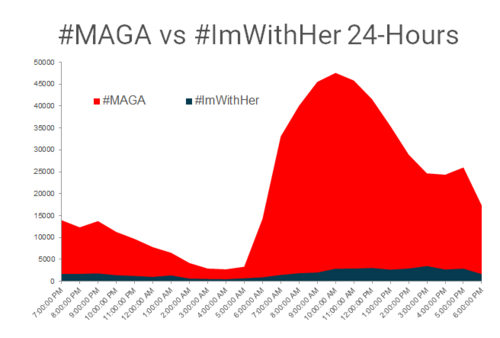 Shown in the graph below is the prevalence of campaign-hashtag use by Twitter users in the past day. Blue depicts use of Clinton’s #ImWithHer hashtag. You can barely see it. Americans who have voted already in the presidential election appear to be evenly divided on the benefits of international trade. According to an exit poll conducted by Edison Research for national media outlets, about four out of 10 voters believe trade among nations creates jobs. Another four out of 10 say it takes jobs from Americans. Republican nominee Donald Trump has railed against decades of U.S. trade policy and has energized working-class voters with his promises to create more jobs at home. Democrat Hillary Clinton has historically supported U.S. trade deals, including as secretary of state. But she has backed off her support for the Trans-Pacific Partnership. President Barack Obama's trade agreement with Pacific Rim nations is still pending. 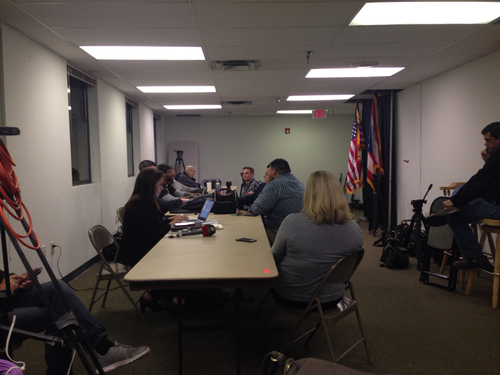 The media waits to be let into the room where votes are counted in Hamilton County, Cincinnati. 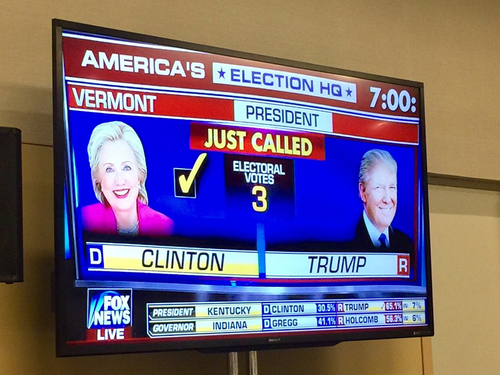 It's probably not all that surprising, but every TV at Trump HQ seems to be tuned to Fox News. What to call them all? In the tidbit category, there are titles to consider. The secret service naming conventions suggest that all names for presidents and their families must start with the same letter. And they must be easily distinguished from each other when said quickly or over the phone. If early reports are right, Donald Trump's name could be MOGUL. So, it would be M's for the rest of the family. The Clinton's are E's. They were given "E" names back when Bill Clinton was president and they have kept them. He was known as Eagle, Chelsea was Energy. And Hillary Clinton was Evergreen. If she wins tonight she may actually keep that name. Well, Evergreen and POTUS that is. Her campaign tells us Hillary Clinton is watching returns with her family, wanting to spend this time with her two grandchildren. Officials also say she has two speeches prepared -- one for a win and one for a loss. This crowd clearly expects a victory, though. As supporters begin to pour into Javits Center - some are shouting and others are practising the wave. 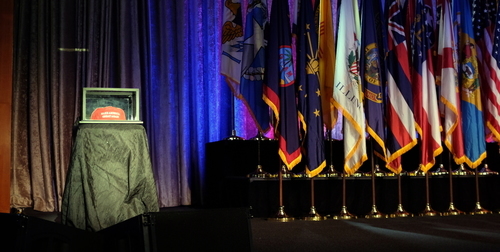 I can't seem to post pictures - we might be losing wi-fi strength as the room fills up. 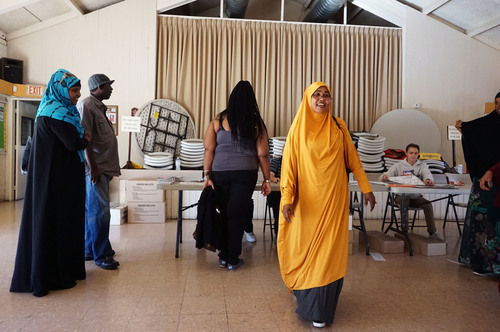 "It pained me to do it, but for the first time in my life I voted Democrat." 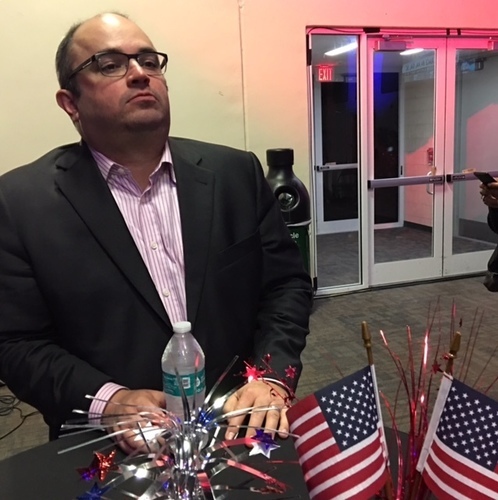 Rudy Fernandez, a Florida Republican and a former special advisor to George W. Bush, is a "never Trump" man, leaving him no other option than to vote for Hilary Clinton, his first Democratic vote ever. Fernandez says he helped George W. Bush get 44 per cent of the Hispanic vote in 2004, but Trump, he predicts, will be lucky to get 20 per cent, some suggest less. 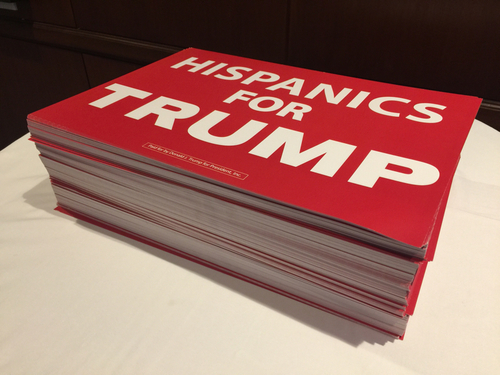 "We have to dust off that 2012 Republican postmortem and begin to attract the growing Hispanic population", says Fernandez, a Mexican American. After the Trump campaign, with its anti-immigrant stance and slurs about Mexicans, is it too late? "It might be," says Fernandez, "when you lose someone like me then there’s a long way to come back." He predicts Clinton will take Florida by two percentage points, double what Obama got, in 2012. Perched on the stage next to the podium set aside for Trump tonight in Manhattan is a glass box with a red Make America Great Again cap inside. (And actually there's another on the other side of the stage as well.) Hashtag unusual.